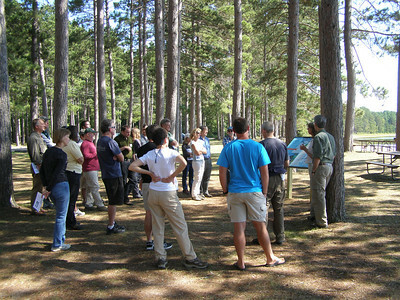 On September 7th and 8th, 2011, the UW-Madison Center for Limnology hosted a team of researchers from across the country as they conducted a site review to assess the myriad research going on as part of the NSF-funded North Temperate Lakes Long Term Ecological Research Project. 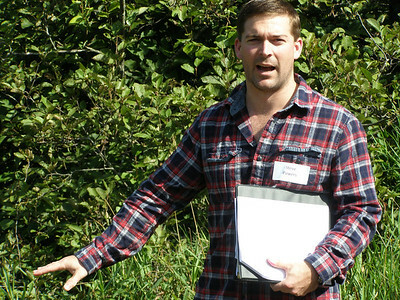 The site reviewers came away impressed with the quality, scope and breadth of the project's research! 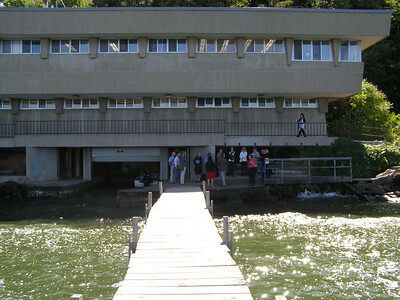 The review team gathered first at the UW Social Science Building and then moved to the pier of the Hasler Lab to hear about research on Lake Mendota, from long-term measurement of water chemistry to "School Yard LTER," a program involving elementary-age students in long term research. 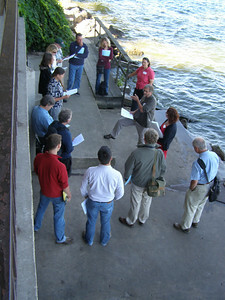 After the long afternoon trek from Madison to just south of Boulder Junction, Wisconsin, site reviewers gathered on the Trout Lake Station dock for an informal cocktail hour/fish fry. 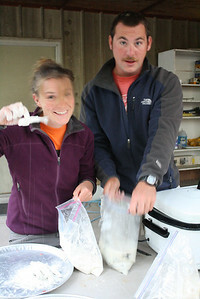 Trout Lake Station research staff Page Mieritz and Eric Brown bread some freshly caught (and long-term invasive) rainbow smelt. 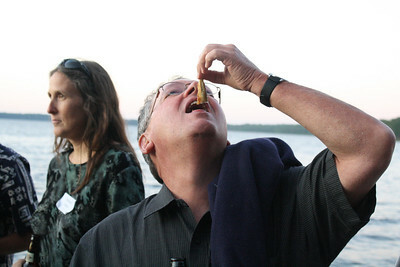 The only way to eat smelt. 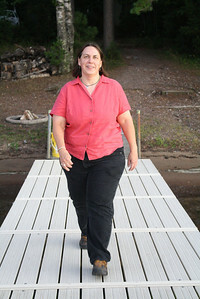 Master of ceremonies and the North Temperate Lakes LTER lead principle investigator, Emily Stanley, joins the gathering only to usher everyone inside for the poster presentations. 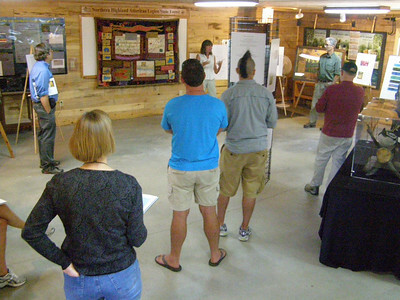 The group gathered in the Trout Lake Station library for a couple more hours of conversation and poster presentations before finally heading off to their Northwoods cabins for the night. 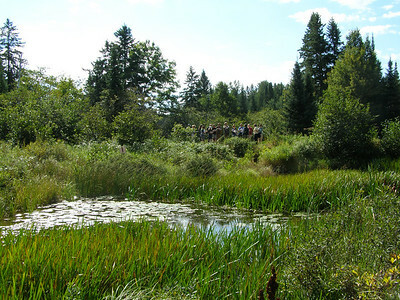 On Thursday, Sept. 8th, after a series of presentations in the Trout Lake Station library, the group headed north of Trout Lake to North Creek to hear about hydrology and ecological effects as well as the movement of nutrients through streams and wetlands. 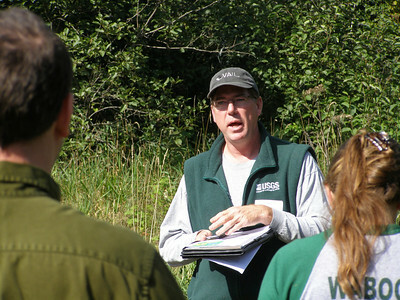 John Walker, with the USGS and co-principle investigator of NTL-LTER, talks about hydrological models the USGS is using to explain how hydrological processes like groundwater/surface water exchange and streamflow changes affect aquatic ecosystems. 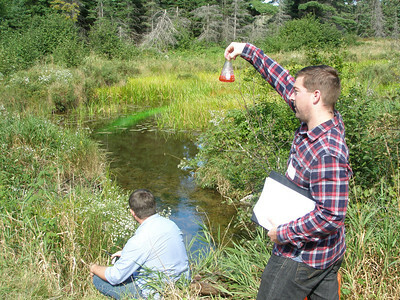 Current CFL grad student, Steve Powers, describes his research on nutrient flow and cycling in Northern Wisconsin streams and wetlands. 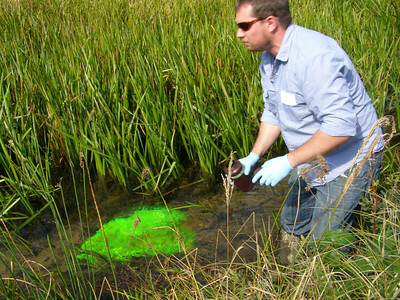 NTL-LTER Site manager and CFL postdoc, Noah Lottig assists with Steve Powers' demonstration of one nutrient tracking method by pouring a fluorescent green dye "tracer" upstream of the site review team on North Creek. 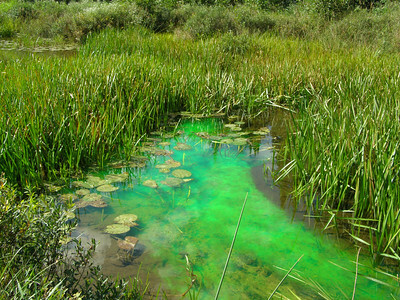 Flowing with the stream, the dye disperses, allowing researchers to track how (and where) nutrients and other chemicals move through the system. 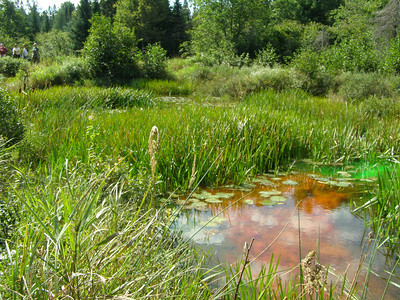 In slow moving streams like those of Northern Wisconsin's wetlands, nutrients can often stop moving through the ecosystem thanks to "slack water" and biological cycling. 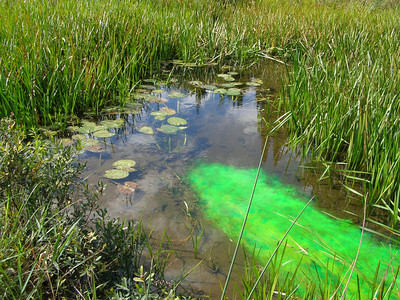 While this means that wetland plants and animals don't receive the nutrients coming from upstream, it also slows the loading of nutrients like phosphorous (which can lead to the eutrophication) into lakes connected to these streams and wetlands. 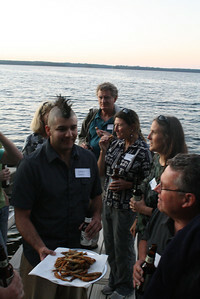 Noah Lottig adds a second dye to the demonstration. 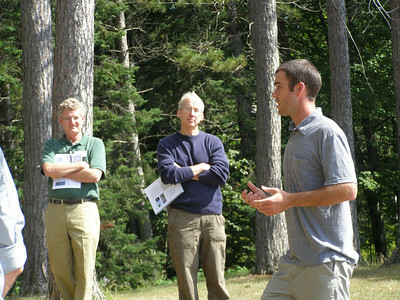 Steve Powers explains the role his tracers play in his research as Noah Lottig demonstrates the water chemistry instruments used to detect the levels of different nutrients. 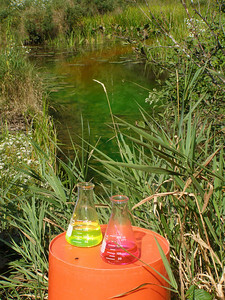 All the supplies needed for North Creek's Electric Kool-Aid Tracing Test. 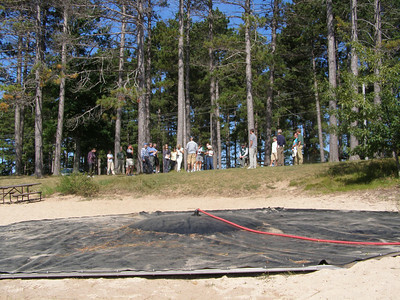 After their visit to North Creek, site reviewers gathered on the shores of Crystal Lake to hear about an ambitious whole-lake mixing project. 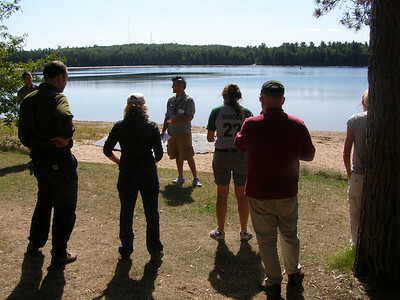 With a Gradual Entrainment Lake Inverter (or GELI) as a backdrop, the group hears about a whole-lake experiment to rid Crystal Lake of invasive rainbow smelt. 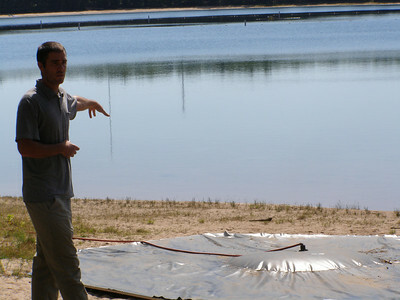 Jordan Read, a PhD candidate in Civil and Environmental Engineering and the NTL Student Representative to the LTER Network, describes how GELI's will hopefully destroy the thermocline of Crystal Lake in warm weather months. 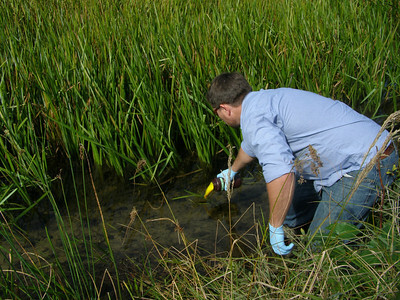 By eliminating the cooler deep water habitat, researchers hope rainbow smelt will be unable to survive, leaving the native warm-water fish unscathed. ...while Jordan Read explanations the physical processes of lake mixing. 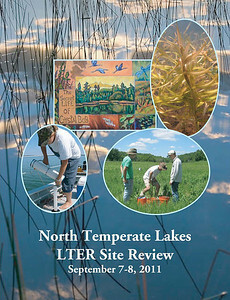 And now it's time for something completely different - site reviewers hear all about the LTEArts program "Drawing Water," a collaboration between the NTL-LTER scientists and Northern Wisconsin artists. 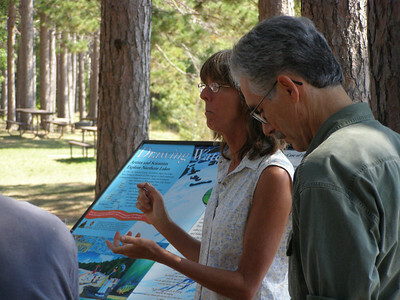 Artist Terry Daulton and poet John Bates discuss the inspiration behind some of their limnologically themed works. 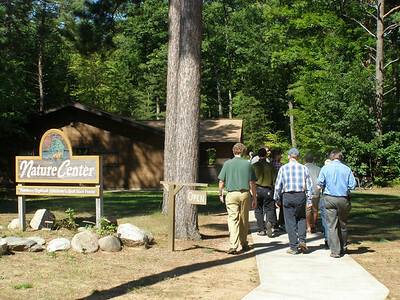 The group heads to the Crystal Lake Nature Center for an exhibition of the "Drawing Water" collection. 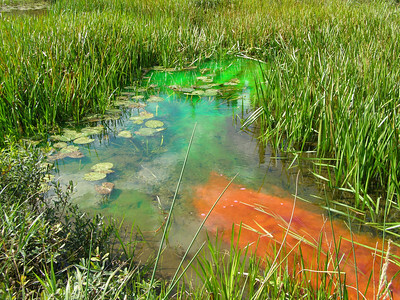 Perhaps the world's only limnological quilt! 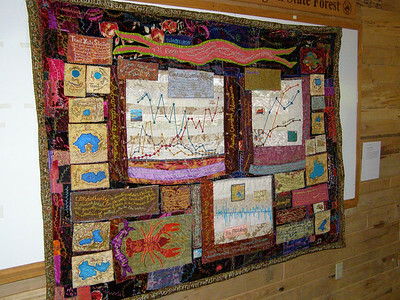 In addition to maps of many LTER research lakes, the quilt includes graphs of ice on/off data, smelt and yellow perch abundance, and more! 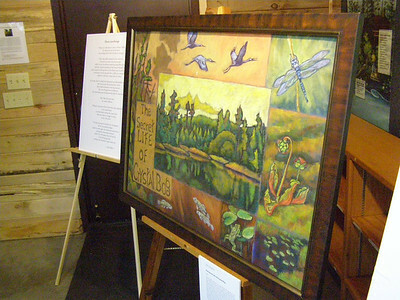 One of Terry Daulton's paintings celebrating one of the NTL- LTER research sites. 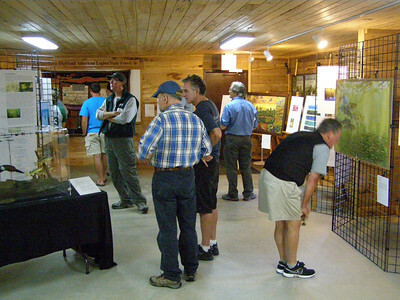 Site reviewers and hosts alike peruse the displays. 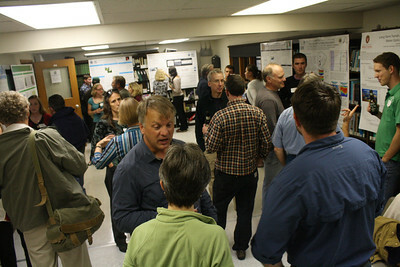 The group ends their visit on a high note, discussing new and unique ways to engage the public and communicate science.